Occurrence: Chopped nuts in foods and as garnishes. More information..
Commercial nuts extracts or fresh nut extracts. Nordlee et al. (1996)  made extracts of Brazil nut, transgenic soybean and nontransgenic soybean with 1:10 (w/v) 0.01M phosphate buffered saline, pH 7.4, by rocking overnight at 4°C. These were clarified by centrifugation at 82,000 x g for 1h and filtered through 0.45 µm and 0.2 µm filters into an equal volume of sterile glycerol and stored at 4°C. Clark and Ewan (2003)  classified the wheals as grades 1-5 with SPT 0-2 mm, ≥2 mm, ≥3 mm, ≥ 4 mm etc. Borja et al. (1999)  used prick by prick (PBP) with Brazil nut with a 1:10 w/v extract. A wheal 5 mm greater than saline control was considered positive. Nordlee et al. (1996)  used 1.8 mg/ml histamine as positive control and saline diluent as negative control. Tests started with 1:1,000,000 dilutions and continued with less dilute extracts until a 3mm diameter wheal was observed in the patients sensitised to Brazil nut. Clark and Ewan (2003)  reported results for 1000 patients in a study of patients allergic to peanut or a tree nut (or several nuts). Bartolomé et al. (1997)  and Borja et al (1999)  tested 1 patient each. Ewan (1996)  tested 62 patients aged 11 months to 53 years. Nordlee et al. (1996)  tested 9 Brazil nut allergic patients and 8 controls. Clark and Ewan (2003)  found that 99.5% had SPT ≥2 mm to the nut which caused the main clinical reaction; 98% had SPT ≥3 mm; and 91.6% SPT > 4 mm. For Brazil nut there was an increase in SPT diameter only when severe reactions (grade 5; median 14 mm) were compared to mild- moderate reactions (grade 1-4; median 10 mm; P = 0.0005). 3% of Brazil nut tolerant patients, who were allergic to peanut or another tree nut, had SPT ≥ 9 mm; only 54% had a negative SPT (0-3 mm); 43% had positive SPT in the range 3-7 mm. Murtagh et al. (2003)  report a positive skin prick test from 10 patients from whom sera were obtained. Bartolomé et al. (1997)  reported that the patient gave a positive skin prick test response to Brazil nut, kiwi and hazelnut extracts, and was negative to regionally specific aeroallergens and other food extracts. Ewan (1996)  reported that 18 patients reacted positively to Brazil nut. Nordlee et al. (1996)  reported that 9 patients gave a positive skin prick test to Brazil nut extract. 3 of these patients were tested with transgenic soybean extract and gave a positive skin prick test but not to non-transgenic soybean extract while 3 control subjects did not react. Pastorello et al. (1998)  ground the pulp of the nut in a mixer and then defatted it with several passages in acetone followed by paper filtration. The powdered, defatted nut pulp was dried overnight and suspended 1:10 (w/v) in 0.1M phosphate buffered saline, pH 7.4, for 2 hours at 4° to 8°C. The extract was centrifuged, filtered, and stored at –20°C. Bartolome et al. (1997)  ground, defatted, and extracted nuts in Coca's solution by stirring. The extract was centrifuged and proteins precipitated using acetone and lyophilised after sterile filtration. Nordlee et al. (1996)  extracted Brazil nuts and soybeans with phosphate buffered saline containing 0.02% sodium azide, which was also used as diluent. Arshad et al. (1991)  mixed 0.5g nut powder with 10ml of 0.125M sodium bicarbonate and rotated for 2 hours at 4°C. The extract was centrifuged for 15mn at 7000rpm, filtered, desalted on a PD10 column and lyophilised. Other studies reference the method of Sun et al. (1987)  for the preparation of Brazil nuts extracts. Number of Patients:There are several studies ranging in size from a single patient up to 731 patients (Pumphrey et al., 1999 ). Murtagh et al. (2003)  tested sera from 10 patients allergic to Brazil nut. 9/10 patients had positive RAST assay results when collected sera were presented with native Brazil nut extracts in vitro (Murtagh et al. 2003). Specific IgE (UniCAP, Pharmacia(r)) was determined with the following result: IgE for Brazil nut, class 2 (2.37 kU/l) (Borja et al 1999 ). Pastorello et al. (1998)  studied sera from 11 patients with clinical symptoms after ingestion of Brazil nut and a positive CAP result to Brazil nut as well as 10 patients with a positive CAP but no symptoms. The mean CAP result for 6 patients with anaphylaxis was 36.41 kU/l. The difference between symptomatic and asymptomatic patients was highly significant. The patient serum showed a high level of specific IgE by RAST to Brazil nut (> 17.5 PRU/ml, Class 4) (Bartolomé et al. 1997 ). Nordlee et al. (1996)  reported positive RAST with sera from 9 patients with Brazil nut protein. This could be inhibited with transgenic soybean extract. Pastorello et al. (1998)  separated proteins using 7.5% to 20% gradient SDS-PAGE gel with a discontinuous buffer system. Samples were denatured by heating in 4% SDS and 6% beta-mercaptoethanol at 100°C for 5 minutes. Borja et al. (1999)  separated proteins with 12.5% SDS-PAGE by the method of Laemmli and used a tricine-SDS-PAGE system to study low molecuar mass proteins. Samples were run under both reducing conditions with beta-mercaptoethanol and under non-reducing conditions. Pastorello et al. (1998)  electroblotted proteins to nitrocellulose paper. The blot-nitrocellulose paper was then cut into strips and each was incubated overnight with sera from individual patients under investigation diluted 1:4 (v/v) in blocking solution. To determine the IgE-binding components, the nitrocellulose strips were incubated for 6 hours with 125I-labeled anti-human IgE antiserum (Pharmacia Diagnostics AB, Uppsala, Sweden) diluted 1:5. The unoccupied nitrocellulose membrane–binding sites were then blocked by incubation in PBS, pH 7.4 ± 0.2, with 0.1% (v/v) Tween 20 for 30 minutes at 37°C. Four groups of proteins which bind IgE were identified on immunoblots: <5kD, 15-20kD, 25-40kD, 45-50kD (Arshad et al 1991 ). Nordlee et al. (1996)  reported that sera from 8/9 Brazil nut allergic subjects bound to the 2S protein from Brazil nut and sera from 7/9 patients bound a similar protein from transgenic soybean. Sera from a single patient bound a 42 kDa protein from Brazil nut but not the 2S protein. Bartolomé et al. (1997)  found IgE-binding proteins included the 9 kDa and 4 kDa subunits of the 2S albumin and also the alpha-subunits, 33.5 kDa and 32 kDa, and at least one of the beta-subunits, approximately 21 kDa, of the 12S Brazil nut globulin (also called the 11S globulin). Pastorello et al. (1998)  found that all the Brazil nut allergic patients had specific IgE against a 9 kDa allergen. Other allergenic polypeptides were detected at less than 5 kDa (2 of 11 patients, 18.2%), 14.4 kDa (4 of 11 patients, 36.6%), 22 kDa (4 of 11 patients, 36.6%), 35 kDa (4 of 11 patients, 36.6%), and 48 and 55 kDa (3 of 11 patients, 27.3%). 4 asymtomatic patients showed weak IgE binding at 25 to 58 kDa, which in symptomatic patients represent minor allergens. With the 12.5% SDS-PAGE gels, Borja et al. (1999)  found IgE binding to five bands of 52.2, 41.4, 39, 33.4, and 23.7 kDa under non-reducing conditions. IgE binding under reducing conditions was restricted to two bands of 33.4 and 21.4 kDa. The tricine SDS-PAGE immunoblotting under non-reducing conditions, revealed IgE binding to bands of 19.3, 18.4, and a wide band of 7-12 kDa, probably the 2S albumin. A loss of binding was observed under reducing conditions. Asero et al. (2002)  found that their patient's serum reacted strongly to four distinct Brazil nut proteins at about 18, 25, 33, and 45 kDa, but no reactivity against 2S albumin (10 kDa) was found. Food used and oral provocation vehicle:Murtagh et al. (2003)  used the double-bind placebo-controlled oral challenge consisted of feeding patients, in gradually increasing amounts, flapjack biscuits containing 0-0.53 g of native Brazil nut protein (i.e. approximately one Brazil nut) per biscuit. Number of Patients:Not stated. 10 patients were reported and those with a recent convincing reaction (number not stated) were omitted. The oral challenge was considered positive if signs or significant symptoms such as urticaria or rhinoconjuctivitis were reported during exposure to the nut, but not the placebo. After termination of the challenge, treatments necessary were administered and the patient observed prior to being accompanied home. Challenges were not performed in cases were there was a history of a serious, systemic or life-threatening reaction or where a good history of reaction had been recorded in the last 5 years. De Leon et al. (2003)  showed IgE reactivity to peanut, almond, Brazil nut, hazelnut and cashew nut for peanut- and tree nut-allergic subject sera by Western blot and ELISA results. Raw and roasted peanut and tree nut extracts showed similar IgE reactivities. Inhibition ELISA showed that pre-incubation of sera with almond, Brazil nut or hazelnut extracts resulted in a decrease in IgE binding to peanut extract, indicating allergenic cross-reactivity. Asero et al. (2004)  reports evidence from a single walnut alergic patient of cross-reactivity between walnut, hazelnut and Brazil nut, with IgE reactivity to walnut at 10, 14, 18, 25, 38 and 45 kDa. Brazil nut bound IgE at 18 kDa and this was abolished by pre-absorbtion by walnut. Sicherer et al. (1998)  report that 4/54 nut allergic patients reported a reaction to Brazil nut. However, the symptoms, described as 89% involved the skin (urticaria, angioedema), 52% the respiratory tract (wheezing, throat tightness, repetitive coughing, dyspnea), and 32% the gastrointestinal tract (vomiting, diarrhea) were not associated with specific nuts. Similarly, Ewan (1996)  report 18 Brazil nut allergic patients and symptoms for 62 peanut and nut allergics. Clark and Ewan (2003)  report 162/1000 peanut or nut allergic patients (16%) showed their strongest reaction to Brazil nut. Considering only patients with a clear history of allergy or tolerance to Brazil nut, 60 patients (21%), who were allergic to peanut or another nut, tolerated Brazil nut. Only a single patient has been shown not to react to Ber e 1 (Asero et al 2002 ) and probably bound the 12S protein of Brazil nut. Arshad et al (1991)  found four groups of proteins which bind IgE on immunoblots: <5kD, 15-20kD, 25-40kD, 45-50kD and Bartolome et al 1997  also found binding to the 12S globulin. de Leon MP, Glaspole IN, Drew AC, Rolland JM, O'Hehir RE, Suphioglu C.
Immunological analysis of allergenic cross-reactivity between peanut and tree nuts. Detection of allergy to nuts by the radioallergosorbent test. Clinical and immunological characteristics of Brazil nut allergy. Sensitization to the major allergen of Brazil nut is correlated with the clinical expression of allergy. Borja JM, Bartolome B, Gomez E, Galindo PA, Feo F.
Murtagh GJ, Archer DB, Dumoulin M, Ridout S, Matthews S, Arshad SH, Alcocer MJ. In vitro stability and immunoreactivity of the native and recombinant plant food 2S albumins Ber e 1 and SFA-8. 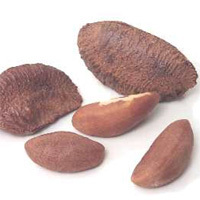 Allergy to minor allergens of Brazil nut. Walnut-induced anaphylaxis with cross-reactivity to hazelnut and Brazil nut. Nordlee JA, Taylor SL, Townsend JA, Thomas LA, Bush RK. Identification of a Brazil-nut allergen in transgenic soybeans. Protein Family:PFAM PF00234; tryp_alpha_amyl; 2S albumin subfamily. Calculated Masses:12211 assuming processing of P04403 and an N-terminal pyroglutamic acid. Oligomeric Masses:Monomeric with two disulphide linked chains. Allergen epitopes:Alcocer et al. (2004)  using sera from 18 patients tested fifteen 14 amino acid peptides derived from the Ber e 1 sequence with seven residue offsets and reported that only one linear peptide, QMQRQQMLSHCRMY, residures 11-24, bound IgE antibodies consistently by both ELISA and dot-blot assay. A second peptide, CRCEGLRMMMMRMQ, residues 60\Z73, was recognised by one serum. Alcocer et al. (2004) conclude that Ber e 1-specific IgE is predominantly directed against either longer or non-linear binding sites. Alcocer et al. (2004)  also made recombinant SFA8 - Ber e 1 chimeras and found that the sequence EGLRMMMRMMQQKEMQPRGEQMRRMMRLAENIPSRCNL which is predicted to form the helix3-turn4-helix4 conformation is immunodominant (although the helix1 region mentioned above, residues 11-24, also bound IgE). Murtagh et al. (2003)  and Alcocer et al. (2002)  used circular dichroism, CD, and reported that the structures were similar at pH 2.2 and pH 6.8. The structure at pH 6.8, was little changed on heating with no unfolding at temperatures lower than 75°C and most of their secondary structure retained at 95°C. They also reported that native and recombinant Ber e 1 were stable to digestion in simulated gastric fluid for over 15 min, with no fragments visible after 30 min. Koppelman et al. (2005)  reported that differential scanning calorimetry (DSC) at pH 2.0 showed a transition centred on 82.5°C which was reversible on cooling. At pH 7.0, the DSC transition was above 110°C. The CD spectrum at pH 2.0 changes reversibly on heating to 95°C. At 37°C, denaturation required approximately 5M Guanidinium hydrochloride at pH 2.0 and 6M at pH 7.0. Koppelman et al. (2005)  used the proposed FAO/WHO protocol for pepsin digestion (approximately 1:1 w/w pepsin:substrate) and reported that Ber e 1 was very stable and required 8-16 minutes for digestion. Reduced alkylated Ber e 1 was rapidly degraded. Moreno et al. (2005)  reported that 2S albumin was very resistant to pepsin digestion under conditions simulating human gastric conditions, and intact protein was observed after 2 hours of digestion as well as a fragment of >6 kDa. After reduction of the fragment, several smaller peptides were identified. This was not changed if Ber e 1 was first heated (100ºC, 20 minutes) and cooled. However, reduction made Ber e 1 more suspectible to pepsin digestion. When the 2 hours of simulated gastric digestion was followed by simulated duodenal digestion with trypsin and chymotrypsin, a mass slightly smaller than the intact Ber e 1 was still observed after 2 hours. Most of the protein was digested and the >6 kDa fragment was replaced by 5.7-5.0 kDa masses. Moreno (personal communication) reports that heating was found to significantly increase the surface activity (as determined by the pendant drop method) of 2S albumins, even though only small changes in secondary structure were detected. At high concentration and neutral pH, DSC data showed the denaturation and aggregation of the protein occurred at ~ 100 ºC. Nature of main cross-reacting proteins:Possible cross-reactivity with other 2S albumins from walnut, cottonseed, sunflower, castor bean (based on sequence homology and inhibition experiments by sera from people allergic to those proteins). 9kD protein bound IgE from all symptomatic individuals in the study. Allergen properties & biological function:The 2S albumin storage protein is a major component of the Brazil nut and has a high content of sulphur-rich amino acids (8% cysteine, 18% methionine). The P04403 sequence is a 146 amino acid protein but purified Ber e 1 corresponds to the 73 amino acid residue long chain plus 28 amino acid residue small chain linked by disulphide bonds. Evidence was found of cyclisation of the N-terminal glutamine residue to pyroglutamic acid, together with ragged N- and C-termini (Moreno et al. 2004 ). Sun et al. (1987)  described two purifications of the 2S proteins. Both started with nut kernels which were ground into a fine paste and defatted three times with hexane. 1g of the dried defatted flour was extracted by 10 mls of 1M NaCl in 0.035 sodium phosphate buffer, pH 7.5. In the first method, this was loaded in 1ml aliquots onto a sucrose gradient to separate 11S, 7S and 2S proteins by the method of Youle and Huang (1981) . Dialysis against deionized water at 4° C removed the 7S and 11S as precipitates (centrifuged at 26000 g for 30 min.). In the second method, the 2S fraction was purified on Sepadex G-150 in 1M NaCl in 0.035 sodium phosphate buffer, pH 7.5, diaylsed against deionized water and lyophilized. A method using extraction with water was also tested. Pastorello et al. (1998)  used a modification of method of Sun et al. (1987) with HPLC on a Superdex 75 column. The fractions containing the 2S protein were concentrated and analysed by N-terminal sequencing. Kernels were removed, milled in dry ice to yield a fine paste and defatted by extraction (four times) with petroleum ether (1g : 10mL) at room temperature. After extraction, the recovery of the Brazil nut flour from original kernels was 25.3% (w:w). 2S albumins were extracted from the defatted flour by stirring for 30 min at 2 ºC with water (1g : 10mL), centrifuged at 7680×g for 30 min at 5 ºC. The supernatant was collected and dialysed against water (5 l) at 2 ºC using a dialysis membrane of ca. 3500 MW cut off, and lyophilised. The extract was then subjected to gel-permeation chromatography on a HiLoad 16/60 Superdex 75 preparative column (Pharmacia Biotech, Uppsala, Sweden) equilibrated in 0.1 M ammonium acetate (pH=6.7) and attached to a Biocad Sprint (PerSeptive Biosystems, Framingham, USA) perfusion chromatography system. Sample (100 mg) was dissolved in 2 mL 0.1 M ammonium acetate and 2S albumins eluted in the same using a flow rate of 1 mL/min at room temperature. 2S albumin isoforms were isolated using gradient chromatofocusing on an anion-exchange column (POROS HQ, 100 x 4.6 mm I.D., 20 micron particle size) attached to a Biocad Sprint perfusion chromatography system, equilibrated in 10 mM piperazine, 10 mM Trizma base and 10 mM bis-tris pH 9 (buffer A). The 2S albumins were dissolved in buffer A and eluted (5 mL/min) at room temperature using an isocratic elution for one minute at starting pH 9.0, followed by a linear pH gradient up to 5 (slope of -0.333 pH/min) developed by mixing buffer A with B (identical to buffer A but at pH 5.0). Any remaining bound protein was eluted subsequently with a linear gradient from 0 to 0.1M NaCl for 5 min, monitored at 280 nm. Peak fractions were collected, dialysed against water (5 l, changed each 12 h) at 2 ºC for 48 h using a cellulose membrane of MW cut off: ca. 3500, and lyophilised prior to further analysis (Moreno et al. 2004 ). Alcocer MJ, Murtagh GJ, Bailey K, Dumoulin M, Meseguer AS, Parker MJ, Archer DB. The disulphide mapping, folding and characterisation of recombinant Ber e 1, an allergenic protein, and SFA8, two sulphur-rich 2S plant albumins. Mass spectrometry and structural characterization of 2S albumin isoforms from Brazil nuts (Bertholletia excelsa). Albumin storage protein and allergens in cottonseeds. Occurrence of low molecular weight and high cysteine containing albumin storage proteins in oilseeds of diverse species. Alcocer MJ, Murtagh GJ, Wilson PB, Progias P, Lin J, Archer DB. The major human structural IgE epitope of the Brazil nut allergen Ber e1: A Chimaeric and protein microarray approach. Moreno FJ, Mellon FA, Wickham MS, Bottrill AR, Mills ENC. Stability of the major allergen Brazil nut 2S albumin (Ber e 1) to physiologically relevant in vitro gastrointestinal digestion. Koppelman SJ, Nieuwenhuizen WF, Gaspari M, Knippels LMJ, Penninks AH, Knol EF, Hefle SL, & de Jongh HHJ. Reversible Denaturation of Brazil Nut 2S Albumin (Ber e1) and Implication of Structural Destabilization on Digestion by Pepsin. As most 11S globulins are relatively themostable, excelsin, the 12S (also called 11S) storage protein of Brazil nut is also likely to be thermostable. Murtagh et al. (2003)  have shown that excelsin is rapidly degraded in simulated gastric fluid. Allergen properties & biological function:Globulin seed storage protein providing the main nitrogen source for the developing plant. The 12S protein (also called 11S) is a legumin-like globulin, abundant in Brazil nut. It consists of an alpha subunit of Mr 33.5 kDa and 32 kDa and a beta subunit of Mr 21 kDa. The alpha and beta subunits are disulphide linked into 50 kDa subunits which are assembled as a hexamer. Nut kernels were ground into a fine paste and defatted three times with hexane. 1g of the dried defatted flour was extracted by 10 mls of 1M NaCl in 0.035 sodium phosphate buffer, pH 7.5. This was loaded in 1ml aliquots onto a sucrose gradient to separate 11S, 7S and 2S proteins by the method of Youle and Huang (1981)  (Sun et al, 1987 ). Kamiya et al. (1983)  also purified the Brazil nut 11S globulin.